ANIMAL SACRIFICE! FORBIDDEN RITUALS! SHOCKING FOOTAGE CAPTURED WITH HIDDEN CAMERAS! Fascinated by forbidden rituals and ceremonies, world explorer Arthur Davis takes a crew with hidden cameras to Africa and South America to secretly record the beauty and horror of the ‚ law of the jungle‚ . BRUTES AND SAVAGES is the filmed document of his death-defying adventures. Shocking, brutal and repulsive, this film mixes bizarre authentic footage with incredibly exploitive (and often hilarious) ‚ re-enactments‚ of his findings. Animal sacrifices, bizarre tribal ceremonies, mating rituals and even brain surgery‚ it‚ s all here! 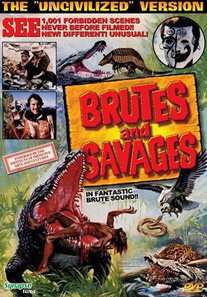 When first released in US theatres in 1978, BRUTES AND SAVAGES was cut down to avoid problems with the censors. This digitally re-mastered DVD release contains almost 15 minutes of additional shocking footage not shown in theaters and has an amazing music score composed and conducted by Euro-Horror music maestro, Riz Ortolani (CANNIBAL HOLOCAUST, HOUSE ON THE EDGE OF THE PARK). A graphic and disturbing film exploring the unknown world of primitive cultures, BRUTES AND SAVAGES is DEFINITELY not for the weak or faint of heart.